On Friday, Feb 3, we began our challenge of the Court Order banning us from the logging area in the Court of Queen’s Bench in Calgary. Noting the full court room, the presiding judge observed that this was obviously a contentious issue. Our lawyer, Mr. Clint Docken, and the Crown’s lawyer asked that the matter be adjourned until Feb 24 to allow time for each side to prepare their cases so the substantive issues could be discussed. The Chief Justice was consulted, and matters were held over until the 24th at 2:00 pm. Our appeal of the Enforcement Order, which the Court Order is partly based on, began about 10 days ago. There has been a lot of media interest in the Castle logging issue. Rather than put a slew of links here, I would suggest Googling “castle alberta logging”. Numerous links to stories will appear. The source with the best overall coverage is the Pincher Creek Voice. We plan to continue protesting near the cattle guard at the entrance to the Castle Special Management Area. If you have some time, please come out and show your support. In addition, rallies are planned for Calgary and Edmonton on Wednesday. Further information will be posted as it becomes available. This entry was posted on Sunday, February 5th, 2012 at 10:19 am and is filed under Uncategorized. You can follow any responses to this entry through the RSS 2.0 feed. You can leave a response, or trackback from your own site. 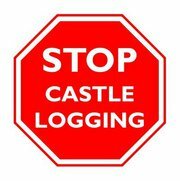 For Additional Information, go to savethecastle.net, or to Stop Castle Logging on Facebook . We're an ad hoc group of individuals concerned about Spray Lake Sawmills' proposed logging in the Castle. Most of us live in, or near, Pincher Creek, Beaver Mines, or the Crowsnest Pass. Please give us your thoughts by leaving a comment in the Reply box. Let us know if you'd like to help, and we'll get back to you.